At the start of my terrain-creating spree, here are two newly finished brick walls. I designed these with Warmahordes in mind, providing linear obstacles (3/4 x 4x 3/4"), as well as the capability to be used for spells such as rock wall (gunnbjorn *cough-cough*). Here's one of the walls in its development stage. The wall itself was made with pink insulation foam bought at Home Depot. I bought a 2x8' sheet for a little under $9, which is more than I'll need for quite some time, though I wont be using it exclusively for small brick wall. I cut out a 4x1" section of the foam, as to leave room for error. The foam was fairly thick and the bricks themselves are only a 1/4" thick, so I had to cut it down a bit. This proved to be a bit of a learning process as you need a very sharp knife and one good cut in one direction. Sawing motion can be seen and may mess up the surface. From there, I lightly marked off 3 1/4" tall rows with a pencil and marked off the ends of the bricks at each centerpoint, doing this for boths sides. After that, I carefully cut into the marks, being sure not to cut too deeps on either side as to not lop off an entire row. After cutting the bricks, I went in with a pencil and opened the grooves up a bit. Once content with them, I chipped and cut away at the bricks at rando (again with care, foam can be quite delicate at this thickness). Once finished with the wall, I mounted it on a 3/4 x 4" peice of plasticard (I would recommend Masonite as it does not flex, however, I did not have Masonite so I settled with plasticard) Then I based it, putting a bit of dirt on the bricks. Important! Super glue cannot be used on foam, as it will cause it to deteriorate, so I used PVA glue to mount and base it. Regarding gameplay, this obstacle would provide cover and act as an obstacle from behind the plasticard area, not the bricks themselves. I felt doing a brick wall that was exactly 4 x 3/4" with no damage or distinction would have been terribly boring and well... stupid. Once letting it fully dry for several hours, I moved onto painting. As aerosol products melt foam, I did not primer the walls. I started out with a base coat of Black. I used Vallejo for this as it is a bit thicker and even with a bit of water it spreads well. (which was needed to get into some of the cracks). After that I applied a drybrushed layer of P3 Battlefield Brown, making sure it was more brown than black. A lighter drybrush layer of GW Snakebite Leather (no idea what its called now) was applied. Then I painted some very very light highlights on the edges using P3 Menoth Base. As a final touch I put some mossy flock on on the base and some of the crevasses to give that old mossed-touched appearance, as well as a few stick on bushes (with a bit of glue). Again, I did not varnish this due to the aerosol, but if you have varnish paint, you can try using an airbrush if you like. This is the begging of a series of terrain I will be creating and hope you enjoyed this brief tutorial. I've always been a fan of the Gunnbjorn model, and though I currently do not play Trollbloods, I decided to pick up ol Gunny and paint him up. I decided to go with a somewhat Cygnarian look to him due to his fluff, and I wanted to do some special basing for him, making it look like he is in a cobblestone street. The brickwork was done with plasticard and greenstuff (the greenstuf was for the rounded off bricks at the edge of the base's shoulder. 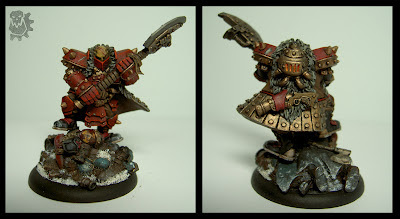 I'd like to possibly start a Gunny list, but reading further up on him and weighing in, hes currently in a poor state due to the lack of support from his army, as he is a very unique warlock among the Trollbloods. Heres another recently finished model for my Gatormen: the Ironback Spitter. I don't like the color scheme Privateer Press gave him on the box/studio model and was more attracted to the color scheme in the Minions book it sported. 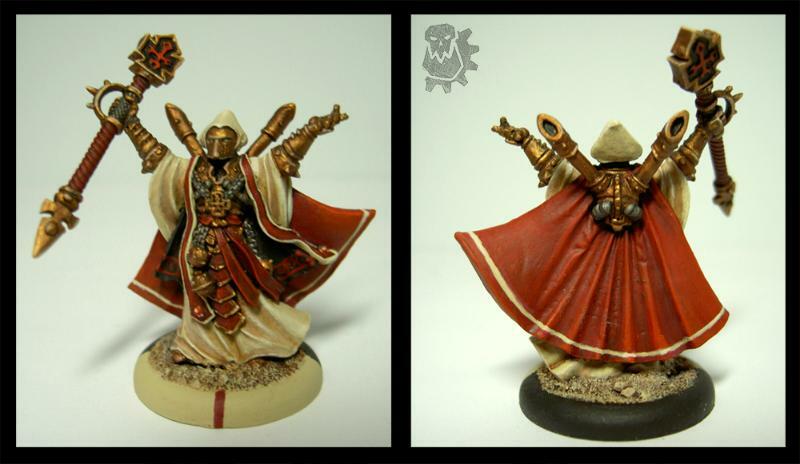 One of my newly completed warcasters, Grand Scrutator Severius. I had a blast working on this guy, as he is one of my favorite Menoth models, maybe one my favorite sculpts from all of Privateers products. 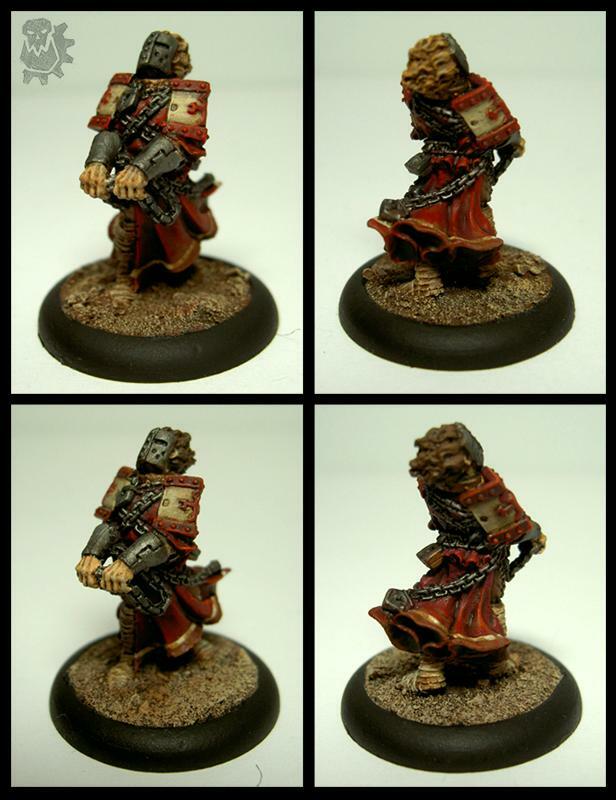 On this model I got to flex a bit with the P3 paints capability for excellent blending. I started off with a layer of Menoth Base for the cream robes, then going over it with a Gryphone Sepia Wash(dont remember the new name for it). Then I went back and highlighted with Menoth Base, then further highlights with Menoth Base Highlight. 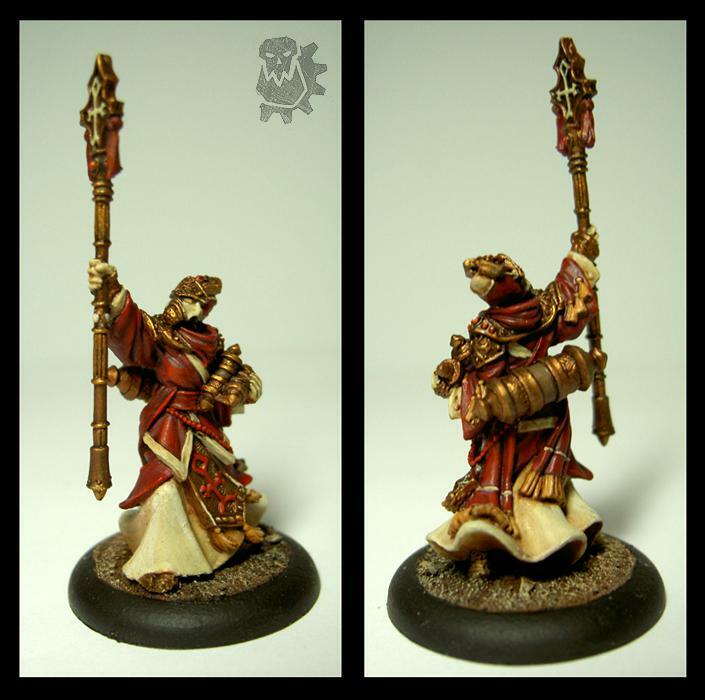 I like to keep my tones for Menoth warm, so the sepia was really helps out. Likewise with the cloak and reds. which started out as Sanguine Base, then a very light and gradual drybrush of Blood Red, and Gryphone Sepia wash, then Blood Red retouching. After that i further highlighted with a mix of orange and red, then orange. All and all, im pretty pleased with him in general. 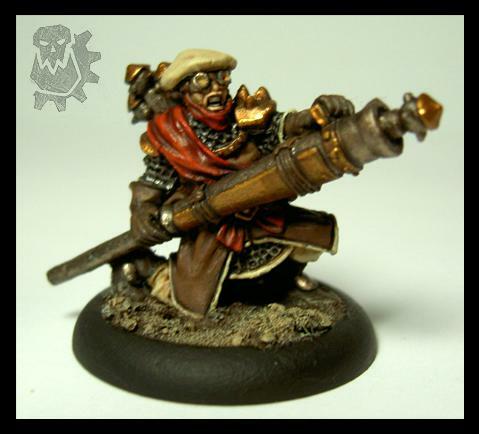 Just a matter of converting Widowmakers and sniping at the enemy warcaster! Some recently and newly finished Warmahordes models! I've gone a bit crazy with solo's lately, and have been loving it. Its nice since I can just sit down, work on it, then its done. Not 9 more guys of the same thing. First up are my two Vassals of Menoth. Next, the Hierophant. Really enjoyed working on this one. And hes quite handy in game, giving Reznik some focus relief with Harmonious Exaltation. Now he can look as good as he performs. Heres the brother of my recent Croak Hunter, though hes a bit more flamboyant. And though its not a solo, here's a Deliverer. Finished up a birthday gift for a friend: Kommander Orsus Zoktavir. Later that night, he tried out his new warcaster in a 2v2 Hordes vs Warmachine battle, Blindwater Congregation and Legion of Everblight vs Retribution of Scyrah and Khador. The game was 25pts a player (though each side managed 51pts). Turn 1 proceed fairly normally, everyone advancing. I dropped a Swamp Pit and moved 2 Gatormen and my Wrastler in to avoid getting shot. The RoS Stormfall Archers set their sights to Lilith and the Raek, lighting them on fire fairly early. The Ghost Sniper went after my Ironback Spitter, however, only put a 3 dmg dent in it. The Ghost Sniper sat between two Juggernauts with Butcher hanging back behind. "That sniper is as safe as he'll ever be there." said my friend. The next turn my Ironback Spitter replied with a giant glob of acid, killing the sniper and damaging Butcher, applying Corrosion to him. The battle was back and forth as it progress. My Blackhide Wrastler was chain pulled by the Battle Mages, then was hacked to bits by Butcher in a matter of seconds. The Stormfall Archers began to whittle away and Narn was also killed off. The LoE Shepard died early in the fight as well, while my Croak Hunter flanked and hovered around Butcher. The turning point was when Butcher popped his feat and generated 4 rage tokens, which proceeded to wipe out my remaining Gatormen and Croak Hunter. In the subsequent turn, Angelius moved in and took out the Arcanist and Adeptus Rahn. The turn after Butcher came over and put down Barnabus and Lilith was shot down, sealing the deal and ending the game. A quick blurb to promote the website Master Craft Gaming. A lot of great stuff here, including tactics, galleries and a lot of other cool 40k stuff. A few of my models had the privileged of being showcased on their site and I've had some great games and lessons with Son of Adam (and his damn Eldar shenanigans), so I figured I'd spread the word! Finally back into the swing of things now that my summer gig is over. Here's a frog! 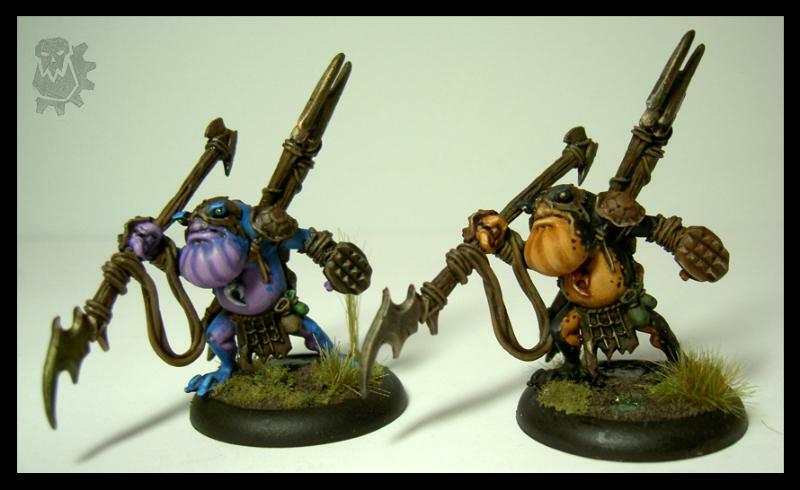 The colors I chose for my Croak Hunter wasn't an exact scheme from any real frog, but I've always liked the splotchy belly look. A little more vibrant than the other models in my Gatormen list, but it definitely highlights his dangerous/poison aspect.